This season (2018/19) we hope to achieve more and provide greater flexibility for our volunteers by working almost every Sunday from September to March – see our dates below. Working within the framework of the Heath Management Plan, our remit includes biodiversity and habitat management together with monitoring work. 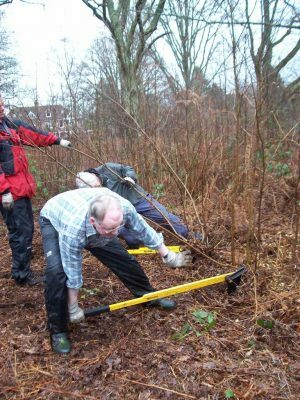 In the winter months we work on maintaining the mosaic of habitats on the heath, by controlling the encroachment of saplings and bramble into the open areas, heather management, cutting of brash, and raking. Prunings, whips and other brash are often woven into dry hedges. Some summer tasks, such as path restoration and bracken control, are carried out on an ad hoc basis when the work is required. This is all great experience for young people hoping to develop a career in ecology/conservation. Whilst all sessions are dependent on weather, most work goes ahead as planned. You do not need special skills and all ages are welcome. Young people under the age of 16 need to be accompanied by an adult. We meet at the Little School Car Park in Heath Road to start work at 10 am, and the sessions last for about 3 hours. Alternatively look for our sail flag which shows where we are working! Tools and gloves are provided together with the all-important mid-morning coffee. You should bring waterproof and/or windproof clothing, your own good strong gloves if preferred and protective footwear. If you have tools such as shears, small saws, bill-hooks or spades, these can be useful. Contact info@petersfieldheath.org for further details of each session ….. but the best thing to do is to come along and watch or participate, or just enjoy being on the Heath.